For some weeks now I’ve been looking forward to writing this article. It is not a daily event that I rediscover a new rebreather with very particular properties. The rediscovery of this rebreather is however a very particular event! During the search for manufacturers of rebreathers I encountered a number of times a nearly untraceable name. There is not much information about the Old Dominion Development Corporation, at least not as a company. That’s why I already gave up on them during my research of products of this firm. 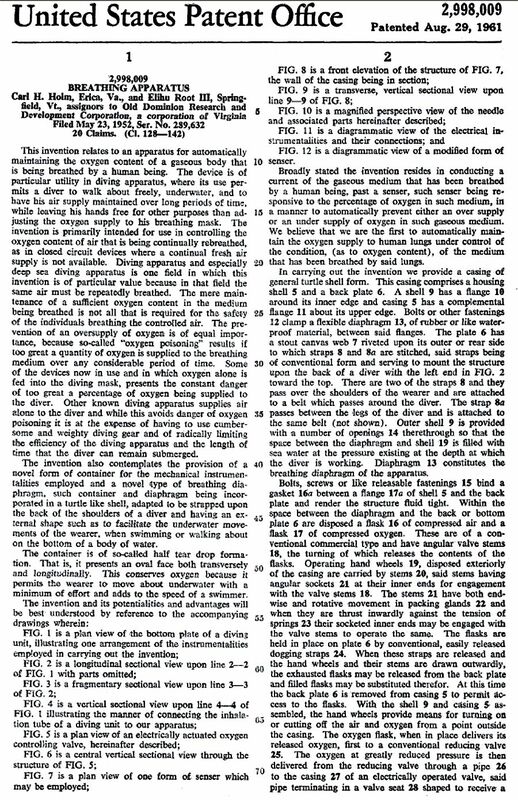 When I was trained to become a scuba diver and later on as I became interested in the history and developments of rebreathers, I have always thought that the "Electrolung rebreather" was the very first rebreather in which the partial oxygen pressure was regulated. The Electrolung does have the reputation to be the first unit in which the oxygen pressure was held constant by ongoing monitoring of the partial oxygen pressure. By the way, the measuring took place by a Polarographic oxygen cell. The polarographic oxygen sensor is often referred to as a Clark Cell [J. L. Clark (1822- 1898)]. In this type of sensor, both the anode (typically silver) and cathode (typically gold) are immersed in an aqueous electrolyte of potassium chloride. The electrodes are separated from the sample by a semi-permeable membrane that provides the mechanism to diffuse oxygen into the sensor. The silver anode is typically held at a potential of 0.8V (polarizing voltage) with respect to the gold cathode. Molecular oxygen is consumed electrochemically with an accompanying flow of electrical current directly proportional to the oxygen concentration based on Faraday’s law. The current output generated from the sensor is measured and amplified electronically to provide a percent oxygen measurement. One of the advantages of the polarographic oxygen sensor is that while inoperative, there is no consumption of the electrode (anode). Storage times are almost indefinite. Similar to the galvanic oxygen sensor, they are not position sensitive. Because of the unique design of the polarographic oxygen sensor, it is the sensor of choice for dissolved oxygen measurements in liquids. For gas phase oxygen measurements, the polarographic oxygen sensor is suitable for percent level oxygen measurements only. The relatively high sensor replacement frequency is another potential drawback, as is the issue of maintaining the sensor membrane and electrolyte. The cells in the Electrolung worked on this polaromagnetic principle, however the anode and the cathode had not been made of silver and gold but of silver and platinum. The permeable membrane had been made of Teflon. Besides this palaromagnetic principle there are several other methods to monitor the oxygen pressure. Today, in general, we find in our Megalodons, Inspiration and Mk-series rebreathers, electrochemical oxygen sensors. 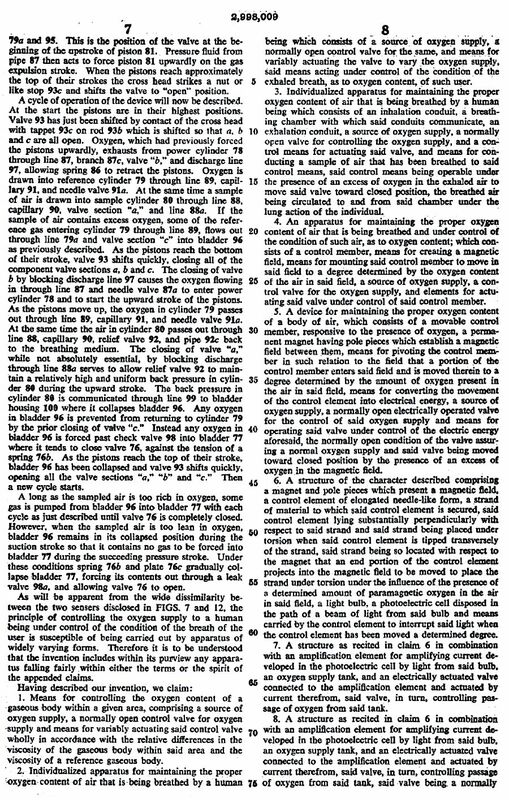 The patent I read however, showed a rebreather which kept its pO2 constant by monitoring its oxygen pressure based on this paramagnetic principle! I found a rebreather which in those times already performed oxygen pressure measuring and also regulated the pO2 by injecting oxygen! The set had been built in a the same manner as the current electronically regulated rebreathers. A high pressure oxygen cylinder, diluent gas cylinder, a scrubber and closed breathing loop and full face mask! 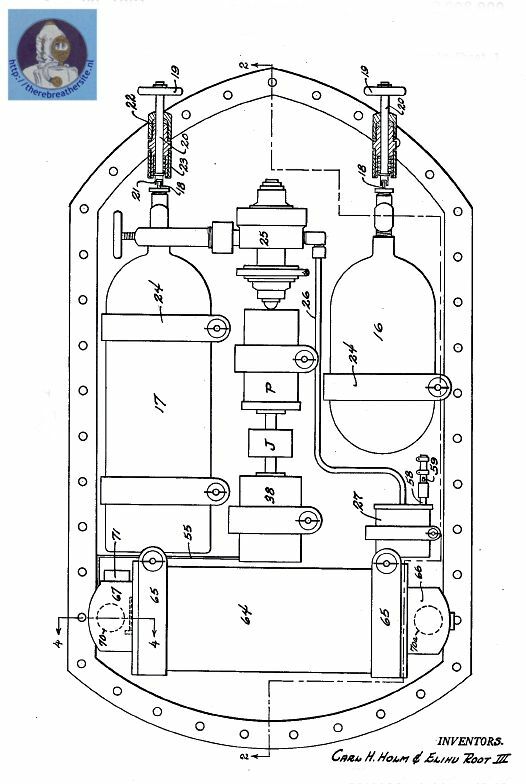 The main difference between the Electrolung and the Marion Device however is the date of invention. The patent for the Electrolung was requested in 1970, under US patent 3727626 which was recognized in 1973. 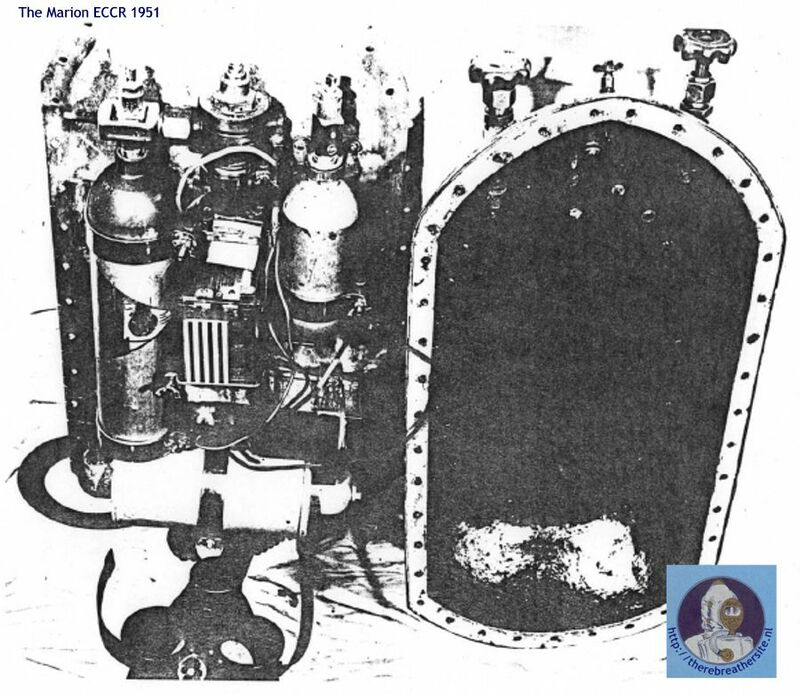 This story is about a Marion Breathing Device which was developed in 1951! 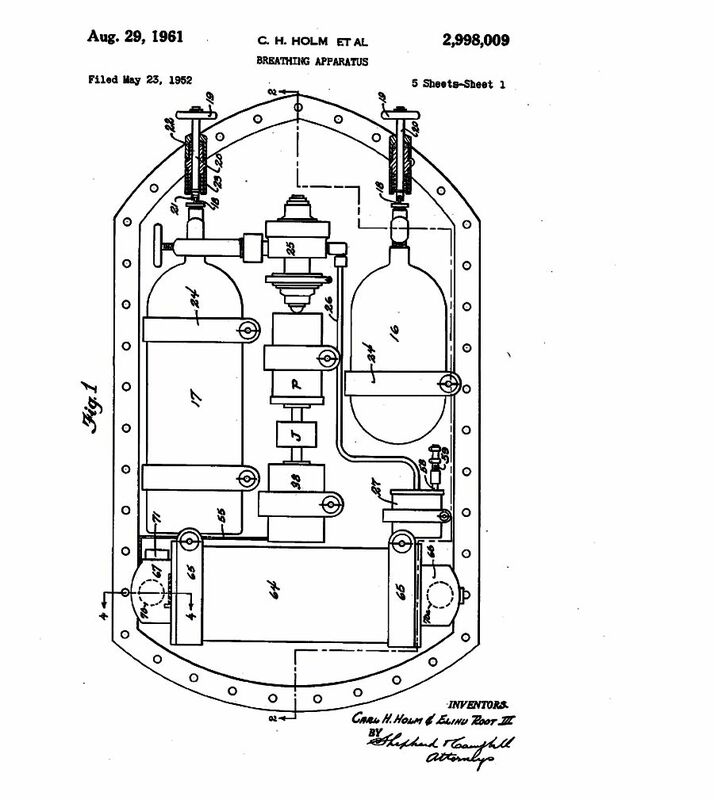 The rebreather was developed and patented. 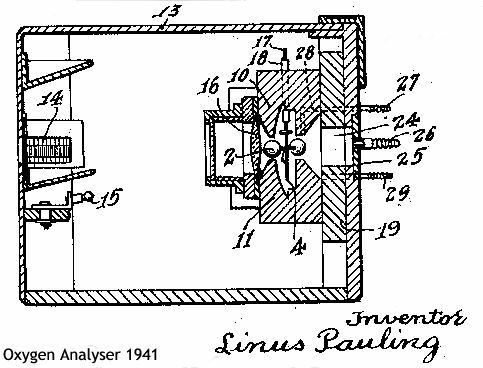 In the patent the inventors correctly mentioned that the oxygen monitoring according to the paramagnetic principle was not invented by themselves, but by the Nobel Prize winner Linus Pauling. 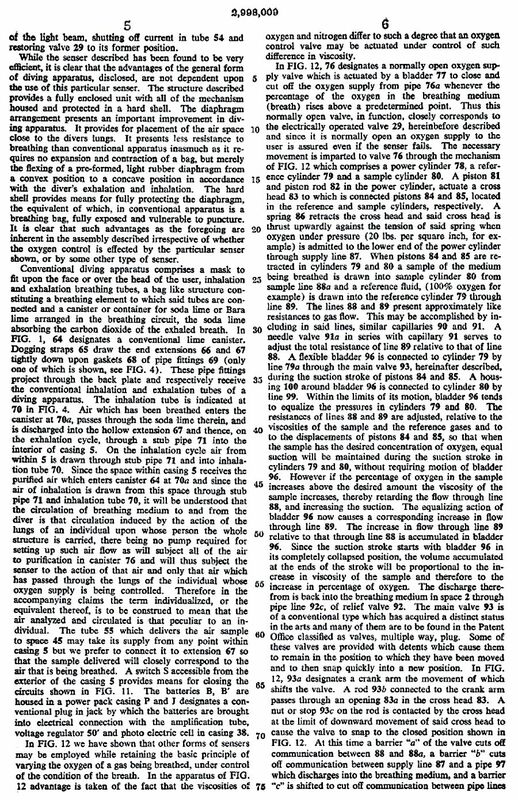 The application of paramagnetic oxygen monitoring in a diving apparatus was by their knowledge (patent text) applied for the first time to offer mankind a constant oxygen pressure for breathing! The fact that this text in the patent has been mentioned is a basis for the assumption that we are dealing here with the first electronically regulated rebreather! What is paramagnetic oxygen monitoring? This principle is invented by noble price winner Linus Pauling (1901-1994) US. Patent 2416344. Well, the principle relies on the property that oxygen is attracted by a strong magnetic field. This property is called paramagnetism. Between two magnets two glass balls filled with little nitrogen are placed on an axle. If oxygen is supplied this will be strongly attracted by the magnetic field and the glass balls with nitrogen will turn away from the concentrated field. As a result, the central axle together with the mounted little mirror will turn round. A light source focused on the mirror will now by the turning shine on a photodiode and deliver an electric voltage. With this voltage a switch can now be activated which regulates the oxygen injection. With much oxygen the oxygen injector will be closed, the light bundle will not shine on the diode. As soon as the oxygen pressure decreases the light bundle will slowly turn to the diode until the switch opens. 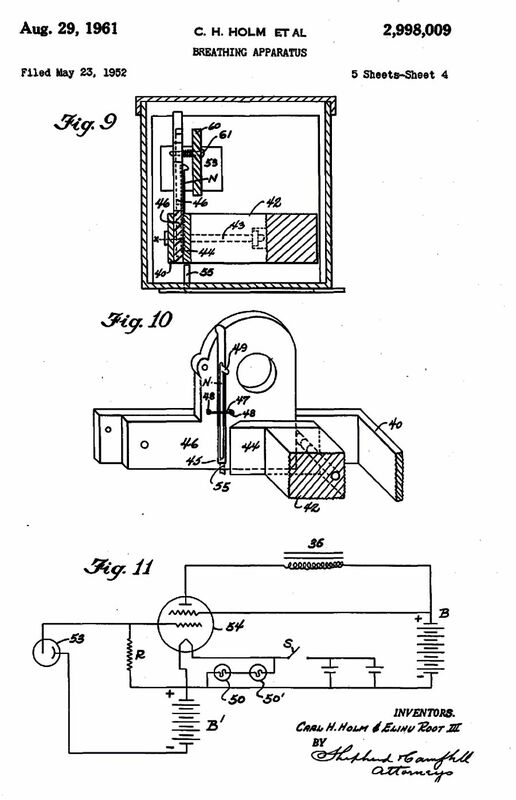 The Pauling patent was filed in 1941! Mr Holm and Root III did this invention at the beginning of the 50’s, supposedly around 1951. 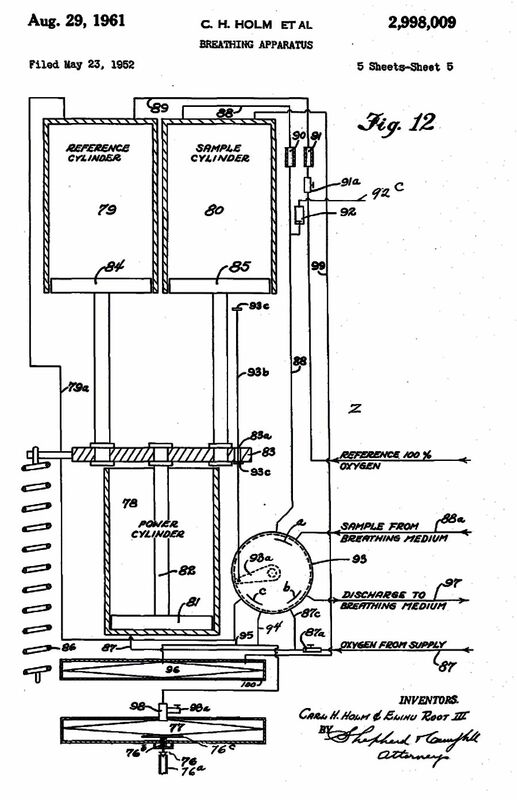 On May 23, 1952 they have offered their invention to the American patent office. 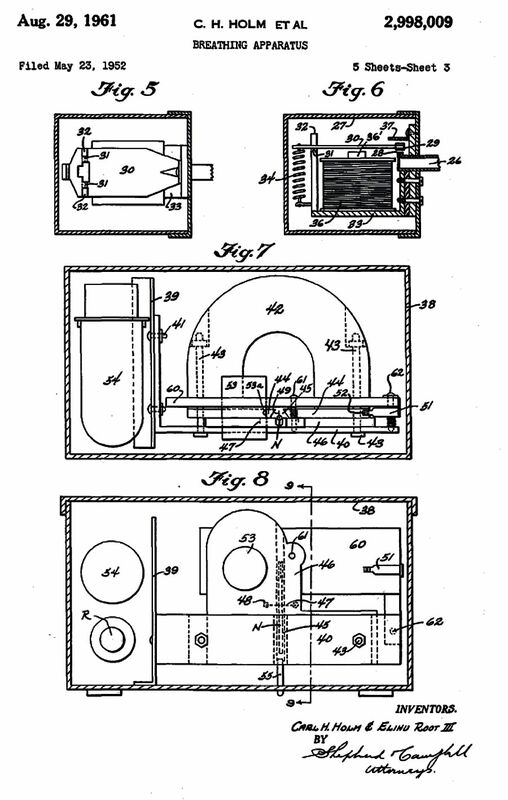 The invention has been examined during a lot of years and on august 29, 1961 has been eventually patented! 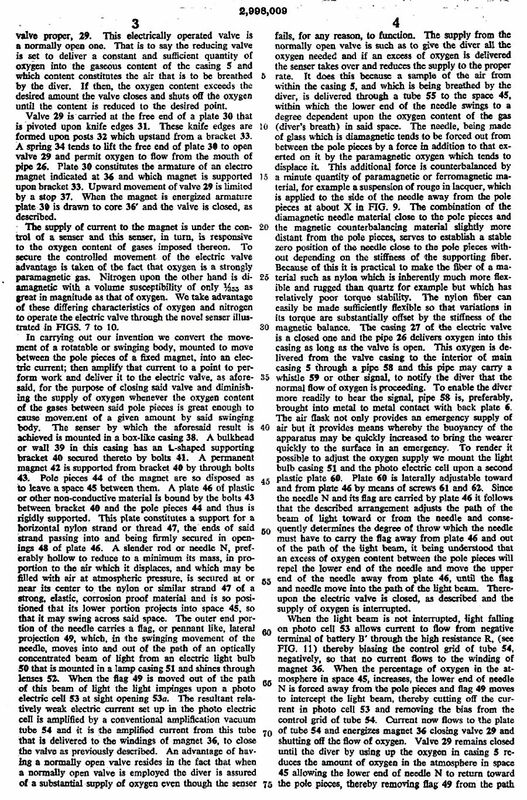 By the way this happened 42 days before my birth date ;) The American patent 2998009 describes the invention of the Marion Device in detail (see below). 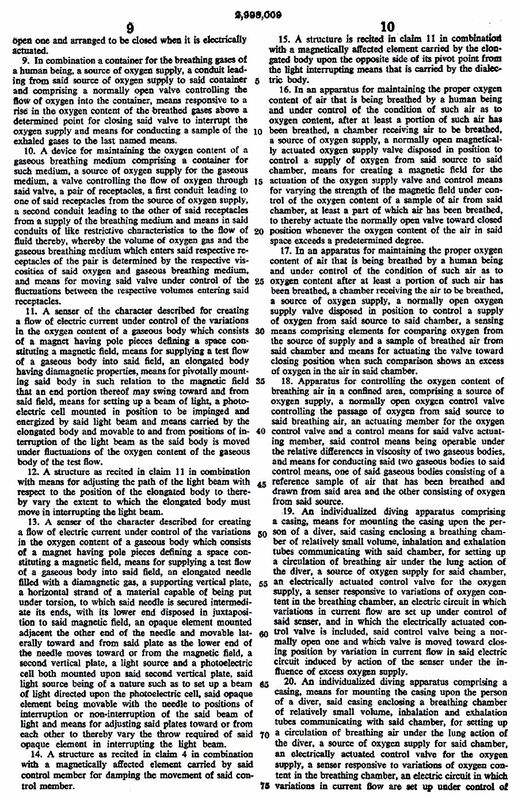 In the same patent a second invention, about how an oxygen doses is regulated on the basis of viscosity, has been set out. A large difference in viscocity between oxygen and nitrogen exists. 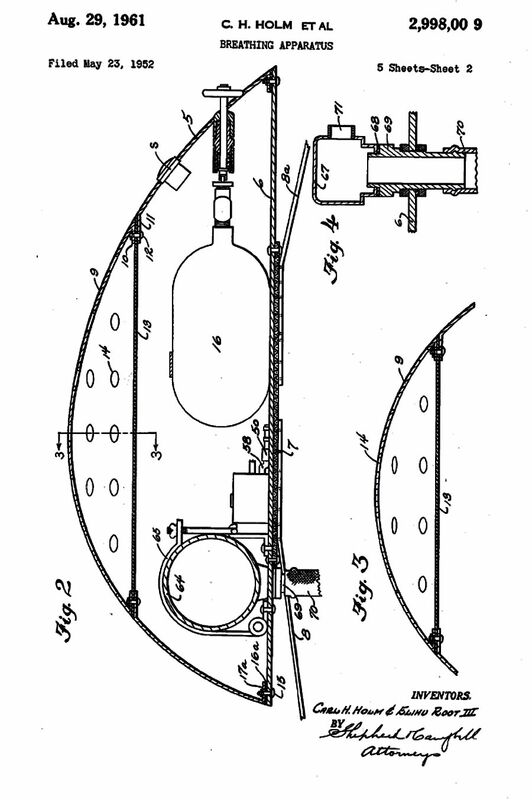 In the patent you’ll find a sketch of such a construction in figure 12. This is the only picture I have been abel to find! The Nedu report can be downloaded using the link below. -Who has information about The Old Dominion Research and Development Corporation? - Who has information about Carl Herluf Holm and Elihu Root III? -Who can help me out with better photographs of these units? -Who has more information about the further development of these units? Thank you for your interest, I hoped you enjoyed the article. Your reaction is Highly appreciated! Please use the email on the bottom of this page! De Nederlandse vertaling is niet voorzien van dezelfde links en afbeelding. Aub in het Engelse deel bekijken. Op het schrijven van dit artikel heb ik me al een paar weken verheugt. Het is namelijk niet dagelijks dat ik een nieuwe rebreather herontdek met zeer bijzondere eigenschappen. De herontdekking van deze rebreather is echter wel een zeer bijzondere gebeurtenis! Tijdens de speurtocht naar fabrikanten van rebreathers kwam ik een aantal keren een naam tegen die vrijwel niet te traceren was. Tijdens mijn training als duiker en later als geïnteresseerde in de historie en ontwikkelingen van rebreathers heb ik altijd gedacht dat de “Electrolung rebreather” de allereerste rebreather was waarbij de partiele zuurstofdruk geregeld werd. De Electrolung heeft de reputatie de eerste unit te zijn waarbij de zuurstof druk constant werd gehouden door meting van de partiele zuurstof druk. De meting vond overigens plaats met een Polarografische zuurstof cel. De cellen in de Electrolung werkten op dit polaromagnetisch principe, echter waren de anode en de kathode niet gemaakt van Zilver en Goud maar van Zilver en Platina. Het permeabel membraan was gemaakt van Teflon. Naast dit palaromagnetisch principe zijn er diverse andere meettechnieken om de zuurstofdruk te meten. Vandaag de dag zitten in onze Megalodons, Inspiration en MK-series rebreathers o.h.a. electrochemical oxygen sensoren. Het patent wat ik echter las toonde een rebreather die op basis van de partiele zuurstofdruk de pO2 constant hield door een zuurstof meting op basis van het paramagnetische principe! Een rebreather in die tijd die een zuurstof meting verrichtte en de zuurstof druk bij regelde door aanvullende zuurstof injecties! De set was opgebouwd op dezelfde wijze als de huidige electronisch geregelde rebreathers. Een hogedruk zuurstof fles, een diluent verdungas een scrubber en een gesloten loop en een volgelaat masker! Het grote verschil met de Electrolung was echter de tijd waarin dit alles speelde. Het patent voor de Electrolung werd in 1970 aangevraagd onder US Patent 3727626 welk in 1973 werd erkend. Het verhaal wat ik hier schrijf gaat over een Marion Breathing Device welke in 1951 ! werd ontwikkeld. De rebreather werd ontwikkeld en gepatenteerd. In het patent vermelden de uitvinders op correcte wijze dat de zuurstofmeting volgens het paramagnetisch principe niet door hen was uitgevonden, maar door de nobelprijswinnaar Linus Pauling. De toepassing van paramagnetische zuurstofmeting in een duiktoestel werd voorzover hun bekend (patent tekstt) voor het eerst toegepast om een constante zuurstof druk voor ademing aan een mens aan te bieden! Het feit dat deze tekst in het patent is vermeld vormt een basis voor de veronderstelling dat we hier te maken hebben met de eerste electronisch geregelde rebreather! Wat is een paramagnetische zuurstof meting? Dit meetprincipe uitgevonden door Nobel prijs winnaar Linus Pauling (1901-1994) US. Patent 2416344. Het principe berust op de eigenschap dat zuurstof wordt aangetrokken door een sterk magnetisch veld. Deze eigenschap wordt wel paramagnetisme genoemd. Tussen twee magneten worden twee met stikstof gevulde glazen bolletjes op een as geplaatst. Wordt er nu zuurstof aangevoerd zal dit sterk door het magnetische veld worden aangetrokken en zullen de glazen met stikstof gevulde bolletjes uit het geconcentreerde veld wegdraaien. Daardoor zal de centrale as draaien samen met het daarop gemonteerde spiegeltje. Een lichtbron die op de spiegel is gefocust zal nu door de draaiing op een fotodiode schijnen die een elektrische spanning afgeeft. Met deze spanning kan nu een schakelaar worden bediend die de zuurstof injectie bedient. Is er veel zuurstof dan zal de zuurstof injector gesloten zijn, de lichtbundel schijnt niet op de diode. Zodra de zuurstofdruk afneemt zal de lichtbundel langzaam naar de diode verdraaien tot de schakelaar weer opent. Het Amerikaanse patent 2998009 beschrijft in detail de uitvinding van de Marion Device. In hetzelfde patent is nog een tweede uitvinding vastgelegd waarbij een zuurstof dossering wordt geregeld op basis van viscositeit. Er bestaat een groot verschil in viscociteit tussen zuurstof en stikstof. In het patent staat op figuur 12 een schets van een dergelijke constructie. -Wie kan mij helpen aan betere foto’s van deze units? -Wie heeft informatie over de verdere ontwikkeling van deze units? Uw commentaar opmerkingen of correcties zijn zeer welkom. Gebruik aub het emailadres zoals hieronder is vermeld. Patent en Nedu rapport zijn onder de tekst van het engelse artikel te downloaden. Special thanks to Rita Oosterbaan for her translation from Dutch into English!! Thank Rita!